From Mr. Owen, National Honor Society Coordinator: Below are the results from Thursday and Friday's drives. What an awesome turnout! Over the two day drive enough units were collected to save 333 lives! That is amazing! Because blood can be broken down into 3 components Plasma, Platelets and Red Blood Cells the 45 whole blood and 12 double red cell units collected at the Henry High School drive can be used to save 171 lives. On April 14th we had a blood drive here at Henry. A collection specialist, Tony Ohnstad, graduated from Patrick Henry and came back to work the blood drive. 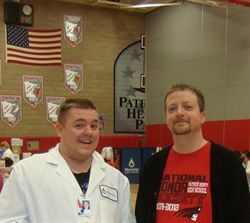 “Its awesome to be back at Henry and to see my old teachers giving blood”. The Legacy interviewed to David McCoy '12 about his experience. What was the process of giving blood like? Well, first they have you read an informative pamphlet, then you talk to a nurse about the risks and they ask you a few questions about your health, you take a survey, then they sit you down, prep the area they’re going to draw the blood from, and after they’re done they put a band aid wrap on and advise you to take a couple of minutes to eat and drink something before going on with your day. Why did you give blood? I gave blood because I hadn’t done it in the past so I feel that since it’s an opportunity to do so and it’s so convenient, why not? Why do you think giving blood important? I think its important being able to give what you have an excess of to people who need it, or will need it in the future, for blood transfusions and things like that. How did giving blood make you feel? I was nervous but overall it’s the same feeling you would get if you were to make meals for Feed My Starving Children or giving to Toys for Tots.